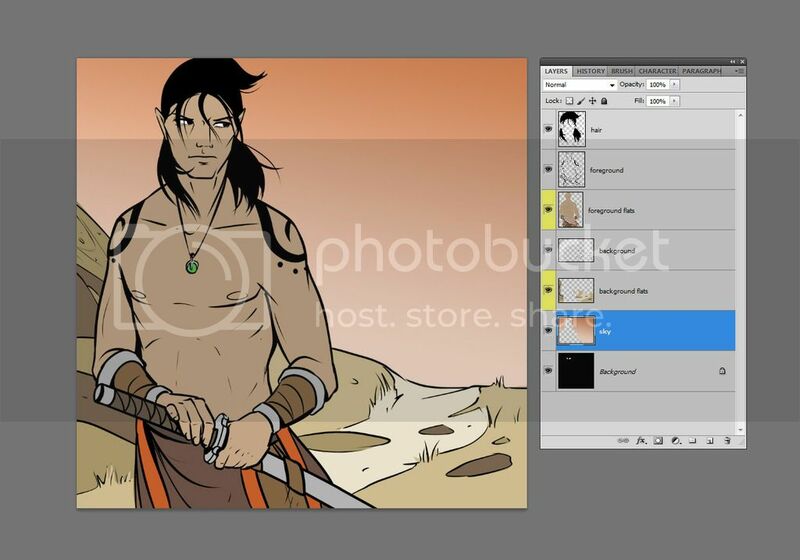 Originally I was only going to post a quick tutorial on how to use photoshop layer effects. But I took too many screen shots so I decided I'd do the whole art progression, start to finish! This is my personal method of making [color] comics. Obviously I don't do this for What it Takes. Just because this work flow is good for me doesn't mean it's good for you. I'm going to try to focus on principles rather than just "do it this way." 12 years of comics has taught me a thing or two about making short cuts look good, and how to maximize my efficiency. For the purposes of this tutorial, I'm going to start very close to the very beginning of the process. I will assume that you have A) a graphics tablet or have a way to scan in your art work at high resolution, and B) an image editing program such as Photoshop or Manga Studio/Clip Studio. On this screen shot, I also demonstrate what kind of brush I use. I'm a very simple artist. I use a 100% hardness round brush, with 1% spacing (so less wobbly lines), pressure sensitivity, and the photoshop plug-in Lazy Nezumi. Lazy Nezumi is a pen stabilizer. Manga Studio has stabilization settings built into the program, but photoshop does not. I can't recommend Lazy Nezumi enough if PS is your primary software. If I'm being a respectable artist (instead of my usual lazy self), I flip the art horizontal to make sure my right-oriented brain isn't making something that looks wonky the other way around. In photoshop, you do this by menu-->image-->image rotation-->flip horizontal. I make any necessary tweaks, and then flip it back. My foreground art uses a thicker line weight (10pt) than my background (8pt) to set them apart for the eye. 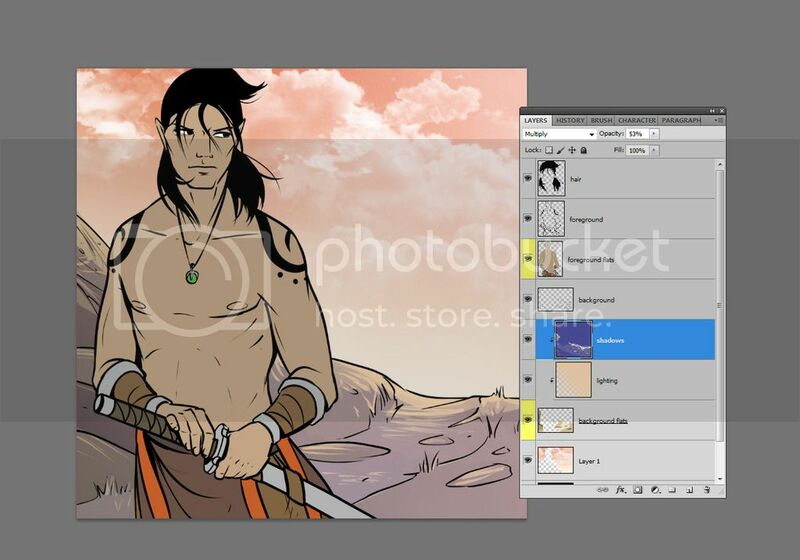 My foreground and background art are on separate layers. I also have hair on a separate layer because I always switch that up and it's just easier for me. 3) I flat-color my line art. Just like my foreground and background line art is on separate layers, my foreground and background colors are also on separate layers, beneath the respective line art. I always have the sky or "far-background" on a separate layer too because I really like adding quick effects on the sky. I change my bottom layer to black (or rather, the same color as my line art) so that any tiny spots I missed just look like line art. I'm not a fan of using hot pink or green as the background color because I don't like things THAT HURT MY EYES. But some people do that so they can easily pick out flat color areas they missed. Manga Studio allows your flat colors to bleed under your line art automatically if you have the right settings, so some of this may not apply for MS users. A) I use the magic wand tool and an Action (menu-->select-->expand selection by 1px) to flat color. A PS Action is a macro: a series of adjustments you can "record" in your Action window. It can be tied to a keyboard short cut. 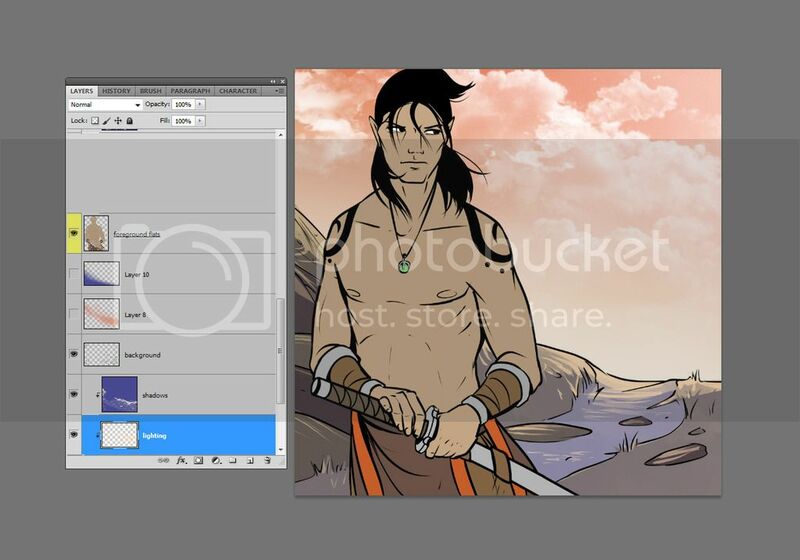 If you're not going to use a photoshop flatting plug in, use an Action. It saves loads of time. Honestly I don't know why I don't have a flatting plug in. I really should. B) I try to always use a gradient for background flats that is representative of the light direction. It helps maintain an illusion of depth. Here, I'm going for a sunset, so I picked orangey colors that worked. It could easily be blue gradient for mid day, or a dark gray for a storm, etc. But I guess what I'm saying is, I never use a single color. So the sky goes from light to orange, and the ground goes from light to a bit darker. 4) Time for details! I work background-->foreground. So the first thing in this picture I'll start with is the sky. For my first major cheap move, how 'bout them free cloud brushes? Next, to make those cloud brushes fit better on the background, I added some cheap lighting effects (soft light, overlay) on top! 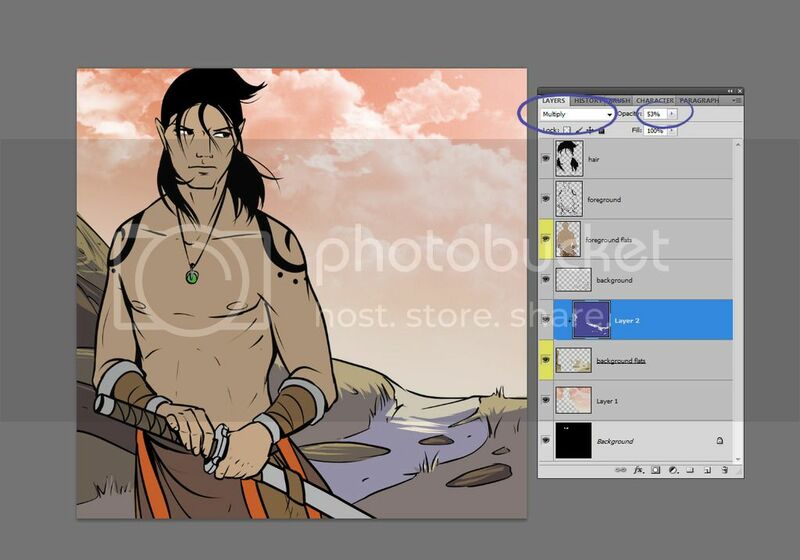 Layer effects are accessed on the layer window (the thing that lists your layers), up top, where it says "Normal." Click that and there's huge drop down of choices! You just have to experiment to find out how you like to use them. For bright lighting effects, screen, soft light, and overlay are my faves. You'll also note those layer effects are CLIPPED onto my layer of interest. That means they only appear on art visible on that layer. 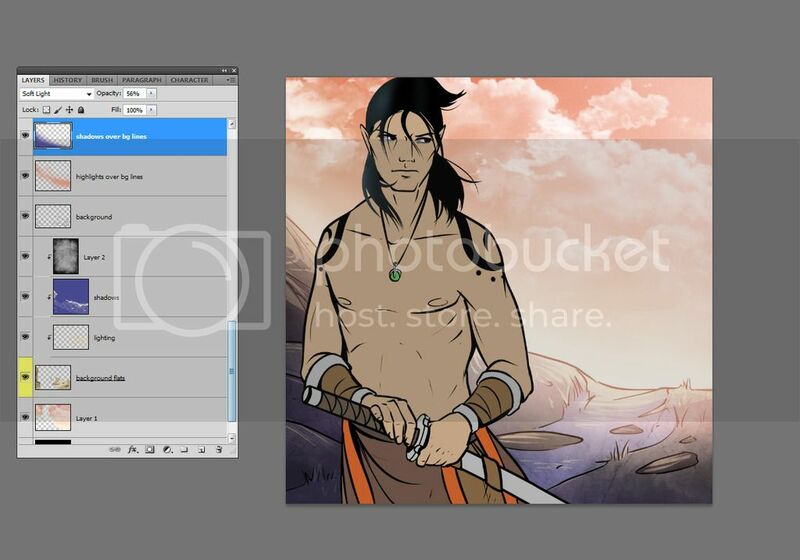 Clipping masks in Photoshop CS5 are accessed by control+alt+G. That will clip the layer(s) you have selected onto the layer immediately below. Time saver! -Expand selection by 1px: so your flat colors bleed under your line art (none of those white pixel artifacts) OR use a plug in that does this for you automatically if working in Photoshop. -Free PS/MS brushes for things that often take a long time to do: (lots available on DeviantART too, I think that's where I originally got mine) for stuff like clouds, leaves, blood splatter, stars, lightning, etc. 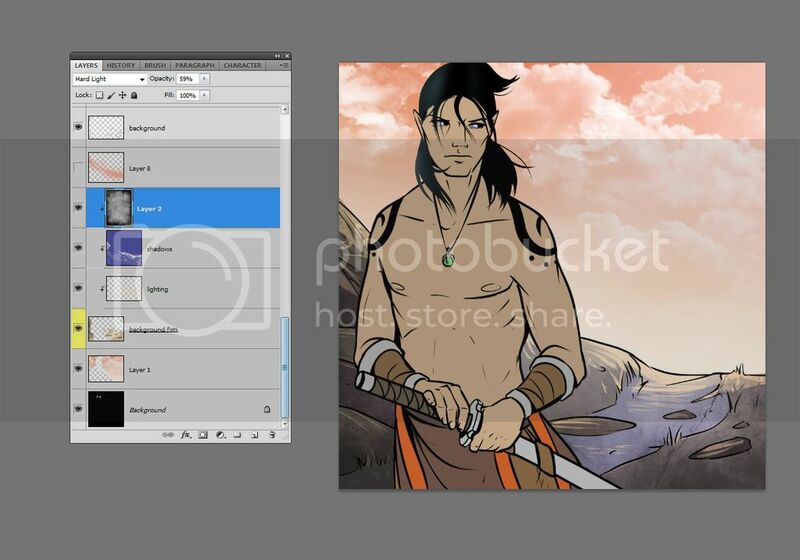 -Clipping masks: so your art only appears on the flat colors or layers you want it to (ie, for me, background vs foreground). -Actions: for a task you repeat a lot, you can record it as an Action and play it via Action window, a keyboard short cut, or tablet hot key. We got up to cheating on making the sky. Now it's time for the background terrain! I clip (again, control+alt+G, or right-click on layer in the Layer window and select clipping mask) my shadow layer onto my background layer. I pick a darkish blue or purple or red or green (generally, a complementary color to the lighting, so orange sunset=blue shadows for this case). I set this layer to multiply. I pick an opacity that works. Importantly, I will never ever ever EVER use black or gray to shade. There's a bit more I do on this layer, but I'm going to explain WHY when I get to foreground shading, because it's easier. 6) Adding lighting to the background. Beneath the shadows, I'm going to add a gradient (same color as the setting sun here, fading to transparent) that originates from the light source. 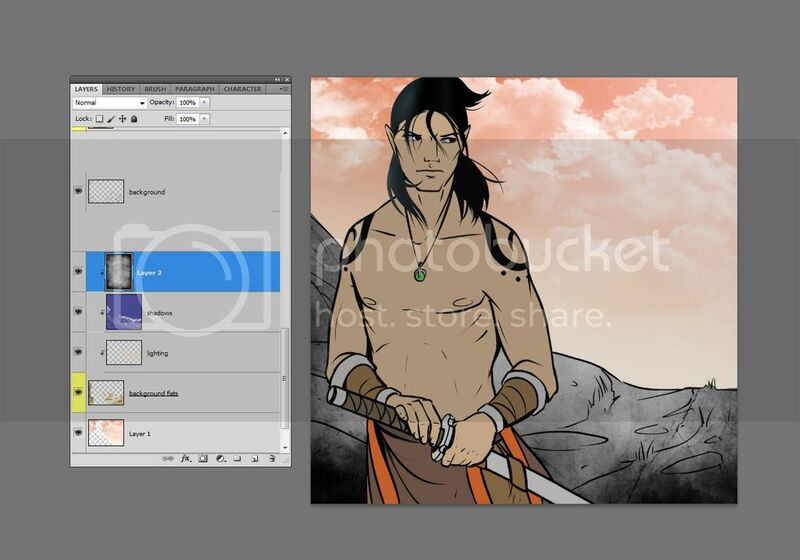 I might change the layer effect to Screen or Soft light, or adjust the opacity. This is fiddling. There's lots of fiddling and no real right way. 7) Subtracting the shadows from the lighting. Right click on the thumbnail of the shadow layer. Select "select pixels." This will select the pixels on this layer. Move to your lighting layer. Delete those selected pixels. 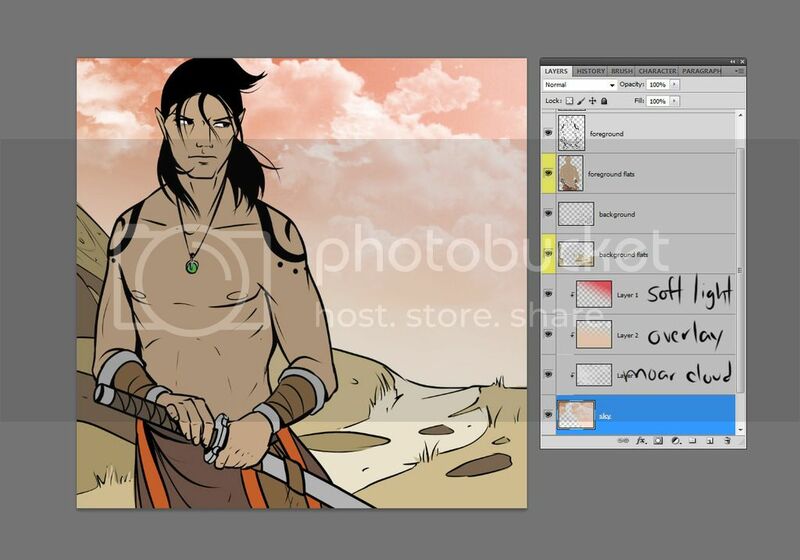 I will repeat step 7 on all layers that have shadows and highlights. 8) Slap some texture on dat layer. Why make your own textures? There are so many available for free! My favorite are grunge textures. I have a huge folder full of textures I can pull out so I can be lazy. 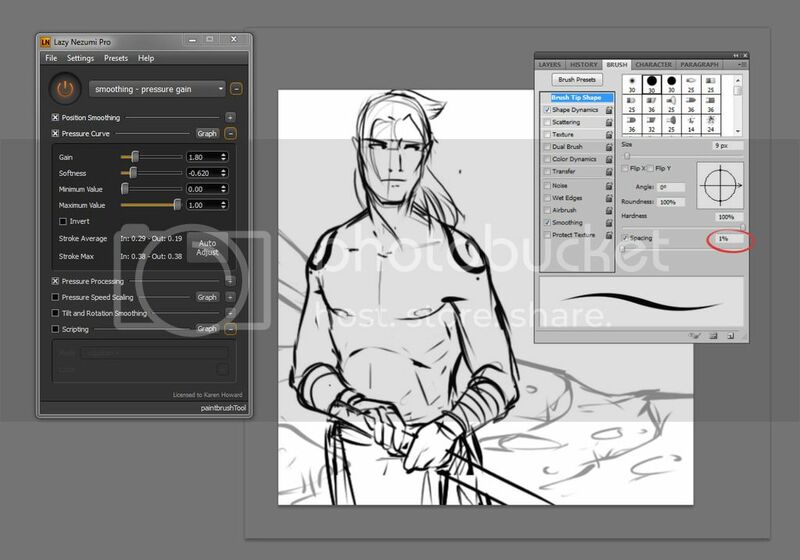 Hit control+shift+U to desaturate the texture (make the layer grayscale). Set that texture to overlay or hard light. 9) COLORS OVER YOUR LINE ART!!!! <---so much fun. I wanted more complimentary colors, so I slapped a quick blue gradient from the bottom left corner, and set that to soft light. And I wanted to add a soft haze over the border of the terrain-sky border, so with 0% hardness, soft round brush, I added some of the orange sunset color on a layer set to screen (100% opacity) over that. While this seems like a lot of steps, using the clipping tool and gradients and layer effects means that outside the first shading step for the background, everything in this post takes under 1 minute. 2) Adding colors on top of your line art can add some 3 dimensionality. This is another reason why I like my background art on separate layers, because by drawing over the background, I can push my foreground further forward. Separate treatments to the planes of vision helps with that illusion. 3) Clipping masks rock and you should be using them.